“New Ticket” Button – Brings up the new ticket form. Quick Ticket Search. You can search by ticket number or keyword. Clicking the ticket from here will open that ticket in a new tab for view/edit. A pie chart which shows the user how many tickets they currently have open and a few other reports to help you get started. Other types of default reports displaying data from your system. Dashboards are user specific. All customizations are personal preference and no other user can change them for you, or be affected by your changes. You can customize the view of the dashboard to your liking. You can add any report you have defined in the reports section into the dashboard just by clicking the “Add Report” button in the upper right. You can also move around the reports and graphs, edit the width and height (small, medium, large), or get rid of them by clicking the x. You can drag and drop columns to reorder them. You can also change the sort order by clicking on the column header from the Dashboard report. You can hide/unhide series from being displayed in the graph by clicking on the series in the legend. By clicking on the blue link for Ticket Name or Ticket Number, the ticket will open into a new tab for editing. You will also notice multiple ticket tabs across the top. 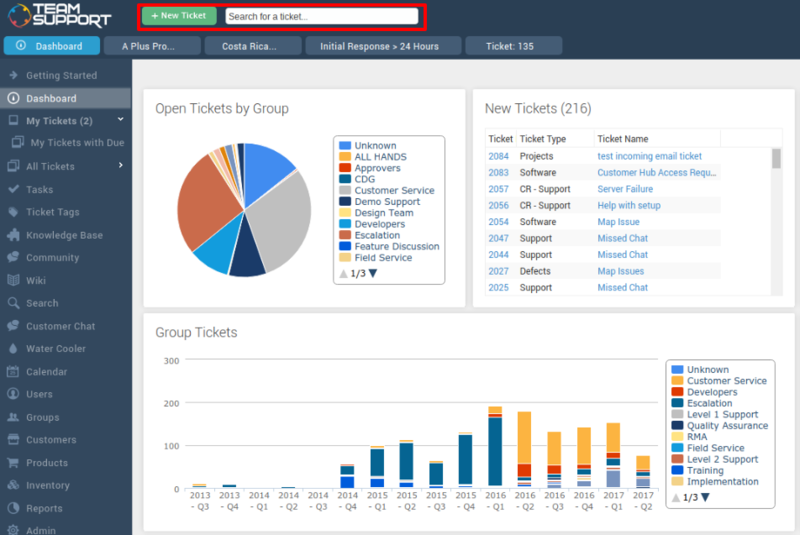 TeamSupport allows you to open multiple tickets, making multi-tasking easier for each user.